Changing airspeed in turns is an effective maneuver for increasing proficiency in all three basic instrument skills. Since the maneuver involves simultaneous changes in all components of control, proper execution requires a rapid cross-check and interpretation, as well as smooth control. Proficiency in the maneuver also contributes to confidence in the instruments during attitude and power changes involved in more complex maneuvers. Pitch and power control techniques are the same as those used during airspeed changes in straight-and-level flight. As discussed previously, the angle of bank necessary for a given rate of turn is proportional to the true airspeed. Since the turns are executed at standard rate, the angle of bank must be varied in direct proportion to the airspeed change in order to maintain a constant rate of turn. During a reduction of airspeed, decrease the angle of bank and increase the pitch attitude to maintain altitude and a standard rate turn. Altimeter and turn indicator readings should remain constant throughout the turn. 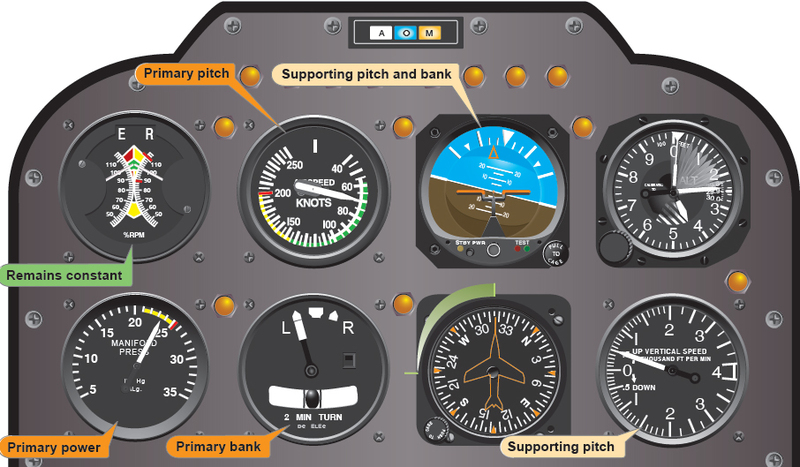 The altimeter is primary for pitch control, and the turn needle is primary for bank control. Manifold pressure is primary for power control while the airspeed is changing. As the airspeed approaches the new indication, the airspeed indicator becomes primary for power control. Two methods of changing airspeed in turns may be used. In the first method, airspeed is changed after the turn is established. In the second method, the airspeed change is initiated simultaneously with the turn entry. The first method is easier, but regardless of the method used, the rate of cross-check must be increased as power is reduced. As the helicopter decelerates, check the altimeter and VSI for needed pitch changes and the bank instruments for needed bank changes. If the needle of the turn-and-slip indicator shows a deviation from the desired deflection, change the bank. Adjust pitch attitude to maintain altitude. When the airspeed approaches that desired, the airspeed indicator becomes primary for power control. Adjust the power to maintain the desired airspeed. Use pedal trim to ensure the maneuver is coordinated. Until control technique is very smooth, frequently crosscheck the attitude indicator to keep from overcontrolling and to provide approximate bank angles appropriate for the changing airspeeds. The use of gyroscopic heading indicators makes heading control very easy. However, if the heading indicator fails or the helicopter is not equipped with one, use the magnetic compass for heading reference. When making compass-only turns, a pilot needs to adjust for the lead or lag created by acceleration and deceleration errors so that the helicopter rolls out on the desired heading. When turning to a heading of north, the lead for the roll-out must include the number of degrees of latitude plus the lead normally used in recovery from turns. During a turn to a south heading, maintain the turn until the compass passes south the number of degrees of latitude, minus the normal roll-out lead. For example, when turning from an easterly direction to north, where the latitude is 30°, start the roll-out when the compass reads 37° (30° plus one-half the 15° angle of bank or whatever amount is appropriate for the rate of roll-out). When turning from an easterly direction to south, start the roll-out when the magnetic compass reads 203° (180° plus 30° minus one-half the angle of bank). When making similar turns from a westerly direction, the appropriate points at which to begin the roll-out would be 323° for a turn to north and 157° for a turn to south. A turn using 30° of bank is seldom necessary or advisable in instrument meteorological conditions (IMC) and is considered an unusual attitude in a helicopter. However, it is an excellent maneuver to practice to increase the ability to react quickly and smoothly to rapid changes of attitude. Even though the entry and recovery techniques are the same as for any other turn, it is more difficult to control pitch because of the decrease in vertical lift as the bank increases. Also, because of the decrease in vertical lift, there is a tendency to lose altitude and/or airspeed. Therefore, to maintain a constant altitude and airspeed, additional power is required. Do not initiate a correction, however, until the instruments indicate the need for one. During the maneuver, note the need for a correction on the altimeter and VSI, check the attitude indicator, and then make the necessary adjustments. After making a change, check the altimeter and VSI again to determine whether or not the correction was adequate. For climbing and descending turns, the techniques described previously for straight climbs, descents, and standard rate turns are combined. For practice, simultaneously turn and start the climb or descent. The primary and supporting instruments for a stabilized constant airspeed left climbing turn are illustrated in Figure 8-15. The level off from a climbing or descending turn is the same as the level off from a straight climb or descent. To return to straight-and-level flight, stop the turn and then level off, or level off and then stop the turn, or simultaneously level off and stop the turn. During climbing and descending turns, keep the ball of the turn indicator centered with pedal trim.